Brownwigg farm supplies and equipment has arrived in Officer. 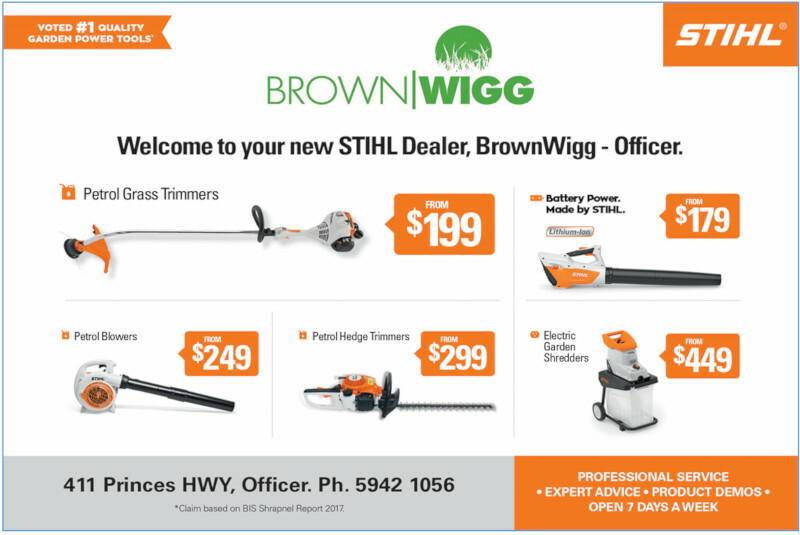 Brownwigg offers a range of services and products including a Stihl shop, Toro lawnmowers, garden care products, stockfeed, pet care items, fencing material, farm supplies and horse feed and accessories. Brownwigg is locally owned and offers friendly service, great advice and is ‘easy to do business with’. “We have showcase brands such as Stihl and Toro as well as our full range of stockfeed, rural supplies, pet speciality, horse feed, hay, fencing and much more. Brownwigg also has stores in Sale, Maffra, Warragul, Bairnsdale, Yarram, Meeniyan, and Traralgon. For any enquiries regarding the Officer store, contact one of the helpful Brownwigg staff members on 5942 1056. Brownwigg Officer is located at 411 Princes Highway in Officer.